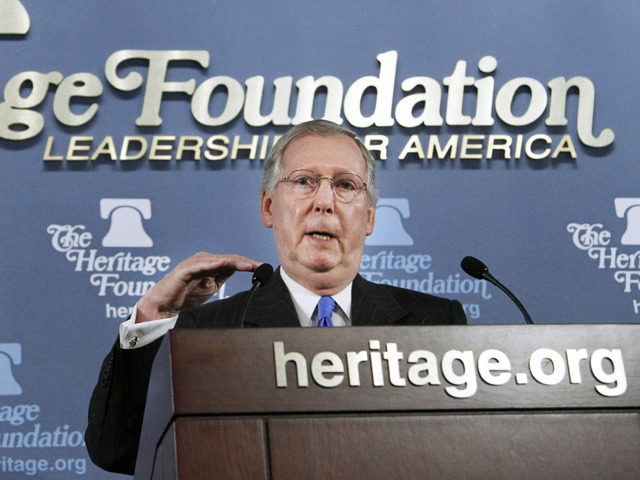 Mitch McConnell: We Will Stop "Liberal Onslaught"
During a speech at the Heritage Foundation on Thursday, Senate Minority Leader Mitch McConnell vowed that Republicans would stop what he described as "the liberal onslaught," with their newfound Congressional authority, and emphasized a GOP agenda of repealing health care and fighting a "left-wing wish list." The Senate leader denied, however, that his agenda was about making President Obama look bad. "I don't want the president to fail," he said. "I want him to change." "This isn't a reason for Republicans to gloat," McConnell said, of Tuesday's election results. "It's a time for both parties to realize who's really in charge - the people - and to be grateful for the opportunity we now have to turn this ship around," he added. The Kentucky senator argued in his speech at the Washington D.C. think tank that Tuesday's midterm elections were a "a referendum" on the Obama administration, and that Republicans had a mandate to fight White House policies on health care, spending, tax cuts, stimulus money and all other "job-killing regulations." "On health care, that means we can - and should - propose and vote on straight repeal, repeatedly," McConnell urged. Will Mitch McConnell Follow the Polls? "If the administration wants cooperation, it will have to begin to move in our direction," he said. McConnell attributed Tuesday's Democratic losses to lack of American confidence in the Obama administration's policy directives, and said that voters feared "that the Europeanization of America would continue unchecked." He also addressed recent comments stating that Republicans' top political goal over the next two years was making sure Mr. Obama did not get re-elected. "Over the past week, some have said it was indelicate of me to suggest that our top political priority over the next two years should be to deny President Obama a second term in office," McConnell said. "But the fact is, if our primary legislative goals are to repeal and replace the health spending bill; to end the bailouts; cut spending; and shrink the size and scope of government, the only way to do all these things it is to put someone in the White House who won't veto any of these things." "Voters didn't suddenly fall in love with Republicans; they fell out of love with Democrats," McConnell added. McConnell will appear on CBS' "Face the Nation" this Sunday.